The Curious Wavefunction: A review of Marcia Bartusiak's "Black Hole: How an Idea Abandoned by Newtonians, Hated by Einstein, and Gambled On by Hawking Became Loved"
A review of Marcia Bartusiak's "Black Hole: How an Idea Abandoned by Newtonians, Hated by Einstein, and Gambled On by Hawking Became Loved"
Black holes are unusual objects. They are now recognized as some of the most important cosmic laboratories for studying all kinds of physics phenomena, from general relativity to quantum mechanics. And yet as science writer Marcia Bartusiak describes in this book, their road to success has been paved with a lack of interest from their own pioneers and many haphazard detours. Bartusiak traces the conception of the idea of black holes to a Cambridge don named John Mitchell who asked whether an object could be so dense that even light would not escape its gravitational pull. This idea lay buried in the scientific literature until the early 20th century when astronomers began asking questions about the constitution of stars. It was the young Indian astrophysicist Subrahmanyan Chandrasekhar who first thought about gravitational collapse on his way to graduate school in England. Bartusiak describes well Chandrasekhar's battles with the old English establishment of astronomers, and especially the doyen of English astrophysics Arthur Eddington, in getting his ideas accepted. He was so frustrated in his endeavors that he switched to studying other topics before he finally the Nobel Prize for his work decades later. Chandrasekhar's life holds many lessons, but one of the lessons is that the best way to win a Nobel Prize is to live long enough. The next actors on the cosmic stage were the volatile Fritz Zwicky and the brilliant Lev Landau and Robert Oppenheimer. Zwicky was a maverick scientist with a prickly personality who ruffled both personal and scientific feathers by his bold conjectures regarding dark matter and supernovae. Landau and Zwicky laid out the first contours of what's called a neutron star while Oppenheimer was really the first scientist who asked what happens when a star completely collapses to a point, what was later called a singularity. Interestingly both Oppenheimer and Einstein - whose general theory relativity shines in all its glory in black holes - either refused to accept their reality or showed a complete lack of interest in them in their later years. Oppenheimer's study of black holes was ironically the most important scientific contribution he ever made, even though it occupied a fraction of his scientific interests and career. Many people think he would have won a Nobel Prize had he lived long enough to see his predictions validated by experiment. One of the reasons why both Oppenheimer and the world at large lost interest in black holes after he predicted them is revealed by the date on which his paper on the subject appeared in the journal Physical Review - September 1, 1939, the date on which the Nazis attacked Poland and inaugurated World War 2. Interestingly the same issue of the journal contained a pioneering paper on the mechanism of nuclear fission by John Wheeler and Niels Bohr. As the war kicked off, fission took center stage while black holes were forgotten. Why did Oppenheimer and Einstein turn away from black holes even after the war? Part of their recalcitrance - at least in case of Oppenheimer - concerned their dislike of Zwicky and Wheeler, but part of it was also an aversion to anything that they thought was not fundamental enough. When I met Freeman Dyson, he confirmed that he had tried several times to talk about black holes with Oppenheimer, but every time Oppenheimer changed the subject, considering black holes too applied, too dull, objects of attention best suited to second-rate minds or graduate students (take your pick). The story of black holes is a good instance of scientific revolutionaries turning conservative. Ironically the scientific grandchildren that Oppenheimer and Einstein despised have now come to haunt the ghosts of their grandparents, showcasing properties that promise to shed light on some of the most basic tenets of relativity, cosmology and quantum mechanics. As Bartusiak narrates, it fell to a young breed of brilliant scientists led by John Wheeler in the US, Dennis Sciama in the UK and Yakov Zeldovich in the USSR to work out the details of black hole astrophysics. They in turn inspired a whole generation of students like Kip Thorne, Roger Penrose and Stephen Hawking who contributed to the discipline. Bartusiak's book also has a readable account of the experimental discoveries in x-ray and radio astronomy which turned black holes from speculation to reality. As the book makes it clear, the importance of observational astronomy and developments in electronics in the discovery of these wondrous objects cannot be underestimated. Frequently it is only a meld of new techniques and new ideas that bring about scientific revolution, and black holes are a good example of this necessary marriage. The book ends with a brief description of Hawking's work on black holes that led to the proposal of so-called Hawking radiation, energetic radiation engendered by the principles of quantum mechanics that can allow particles to escape from a black hole's surface. I was disappointed that Bartusiak does not pay more attention to this exciting frontier, especially regarding the meld of ideas from information theory and computer science with thermodynamics and quantum mechanics that has been published in the last few years. Overall Bartusiak's volume is a good introduction to the history and physics of black holes. My only concern is that it covers very little information that has not been already documented by other books. Kip Thorne's "Black Holes and Time Warps: Einstein's Outrageous Legacy" remains the gold standard in the field and covers all these discoveries and more much more comprehensively and engagingly, while Pedro Ferreira's "The Perfect Theory" which came out this year treads the same ground of experimental discoveries. 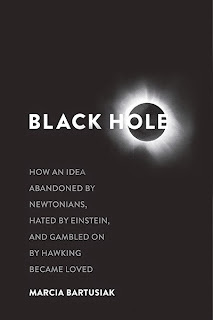 This is not a bad book at all but it came out slightly late: if you really want to read one book on black holes I think it should be Thorne's.